The Rhythm of Cascadian Art & Culture: Big Bang Rhythms Group Drumming, Bellingham — CascadiaNow! This week, the member of the CN! nonprofit family with the most steady beat, Big Bang Rhythms, presents a FREE group drumming class at the Bellingham Senior Activity Center. The rhythm will get you April 25th, 3-4PM! Group drumming improves circulation and relieves stress, as well as providing cognitive enhancement, social interaction, and fun! This event is FREE (suggested donation $10-$15) and instruments are provided. Space is limited so please RSVP to 360-733-4030 to see if there is a spot left for YOU! If this class is full or you can't make it this week, fear not! 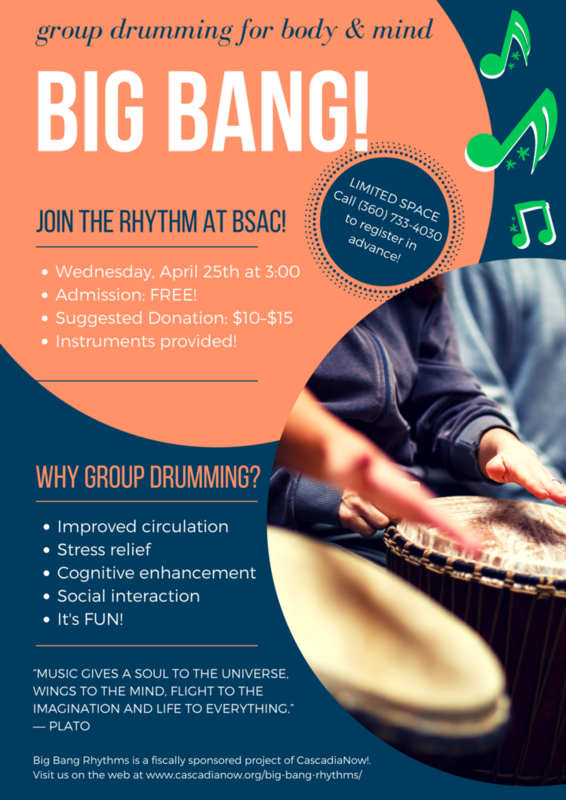 Big Bang Rhythms has Big Plans to bring more group drumming to their Cascadian community!